Brightblack Morning Light was a band which formed in Northern California by Nathan Shineywater and Rachael Hughes, both of whom originally hail from Alabama, Shineywater from Birmingham and Hughes from just outside of Montgomery. Shineywater plays electric slide guitar, and Hughes favors vintage Fender Rhodes pianos; they were accompanied by a varying group of musicians. The band has been "linked to a spirit of folky 1960's revivalism," and they were called a leader in the "freak folk" scene. Praised for their recordings, the band also organized a number of small folk festivals in Northern California. 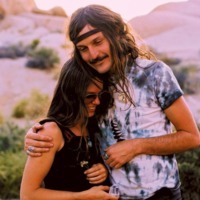 The band eschewed commercial exposure, having chosen a relatively quiet and luxury-free life—they have lived in cars, tents, converted chicken-coops, and cabins, and have recorded music using solar power. They have released three critically acclaimed albums. They were described as "back-to-the-land idealists and activists" who are influenced by such writers and activists as Edward Abbey, Leonard Peltier, Henry David Thoreau, Allen Ginsberg, and Carlos Castaneda. Shineywater also cites Ram Dass, Rachel Grimes, and Hamza El Din.